Fall is here & all I'm thinking is "How can I keep wearing crop tops in autumn?" Okay, well that's not all I'm thinking about, but that's one thing. Hehehe. Summer is over, so we can finally make way for scarves, cardigans, thigh highs, & all those glorious fall commodities that I hold dear to my heart. 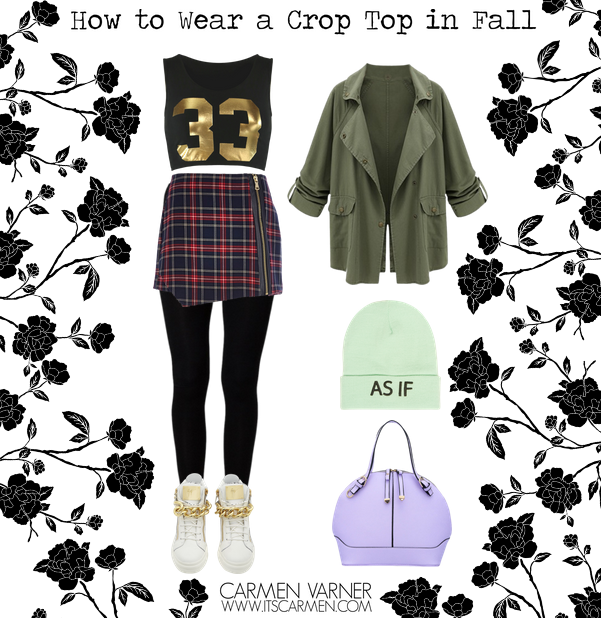 Keep wearing those crop tops y'all because I'm about to show you how to wear a crop top in fall! Yeah, I can rhyme too. In order to wear a crop top in fall without freezing to death (although let's be real it's not going to get too cold here in southern California), you've got to layer your look. First off, pick your crop top of choice. Football season is here so this black & gold 33 crop is my homage to the sport, although I don't really follow it. I love hardware on clothes, so you can add a cool plaid skirt with a zipper detail & some rad high tops with chain. Pair your look with versatile black leggings for warmth. Now that the nights are getting cooler, let's toss in a utilitarian coat. This jacket can be worn in a million different ways. The color is easy on the eyes, natural & pleasant. As with any Carmen outfit, there has to be some sort of color. Toss in a couple pastel accessories. Autumn is the time of year I start busting out my beanies. So this Clueless inspired "As If" beanie is superb. I really love the shape of this lavender hand bag. Great post! I love the skirt! Very practical and spiced up look. Like! Just stumpled on your blog, and I'll definitely be coming back! Lov this post. That jacket is awesome, I have a similar one that I bought over the summer and I'm just dying for it to be cooler outside so that I can finally wear it! I love your style! You know Carmen I've never worn a crop top but I really want to! Maybe this will be the season for me to try it out. Great set girl. Hey, great post and I'm following on bloglovin! I love crop tops so this was a very helpful post for me! Super cute!! Love the top with the coat- perfect for Boston! So cute! I love the "As If" hat and the plaid shirt. It's like Clueless! I love the jacket as well, it is one of my fall essentials. This is such a cute outfit. I'd definitely like to continue wearing crop tops into fall too and you're right, layers will be key. This is the perfect way to keep wearing crop tops in fall! I love that jacket! The jacket helps make it possible and the plaid skirt is very cute. I love how you styled it!! I think making sure it's balanced on the bottom makes it more wearable!! Love the skirt!! I bought a similar jacket last year thinking I may not wear it that much but I seriously wore it on repeat! 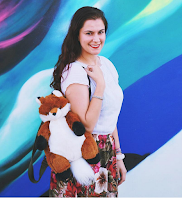 Great tips for transitioning a summer staple into fall! Love this! I discovered crop tops late this past summer and am not quite ready to give them up lol We're not quite as mild here in southern GA as y'all but still no where near real winter weather most days. Thanks for the ideas on bringing them into this season!